In the latest C-Voter opinion poll conducted to gauge the mood of the nation, the NDA looks set to return to power if the General Elections were held today. With the Lok Sabha elections only a year away, the C-Voter poll comes as a reassurance to the BJP and a blow to the Congress after the results of Gujarat elections gave some hope to the opposition of a possible 2019 comeback. The NDA is projected to gain 5 seats in Bihar after Nitish Kumar’s Gharwapsi to the NDA with the UPA being relegated to 4 seats. Moreover, the NDA is projected to retain all the 7 seats in Delhi. In Haryana, the NDA is projected to up its seatshare by 1 and win 8 seats. In Himachal Pradesh, the NDA is projected to retain all of its 4 seats from 2014. In Karnataka, with the Assembly Elections looming, the NDA is projected to win 5 more seats than it won in 2014 with the UPA to win 4 seats less. In Maharashtra, the NDA is projected to win 44 seats and the UPA is expected to drop to 4. In addition, the NDA is projected to win all the seats from Mizoram, Meghalaya, Manipur and Nagaland. The NDA is projected to make massive gains in Odisha with the alliance expected to win 12 out of the 20 seats from the state and the BJD to suffer huge losses and be restricted to 8 seats. In Chhatisgarh, however, the UPA is projected to make a gain of 6 seats with the NDA reduced to 4 out of 11 seats in the state. In Gujarat, the NDA is set to lose 3 seats as the UPA is projected to win 3 seats where it failed to open its account in 2014. In Jharkhand, the UPA is projected to take its tally to 6 from 2 with the NDA to lose 5 seats and drop to 7 from 12. In Madhya Pradesh, NDA is projected to drop to 23 from 27 in 2014 with the UPA to win 6 compared to 2 the last time around. In Punjab, the UPA is expected to make massive gains and up its tally by 6 and win 9 seats. In Rajasthan, the NDA is projected to win 20 seats where it won all 25 seats in 2014 with the UPA winning in 5 seats. In Uttar Pradesh, the NDA is expected to secure 60 seats compared to 73 last time around and UPA is projected to take its tally up to 18. 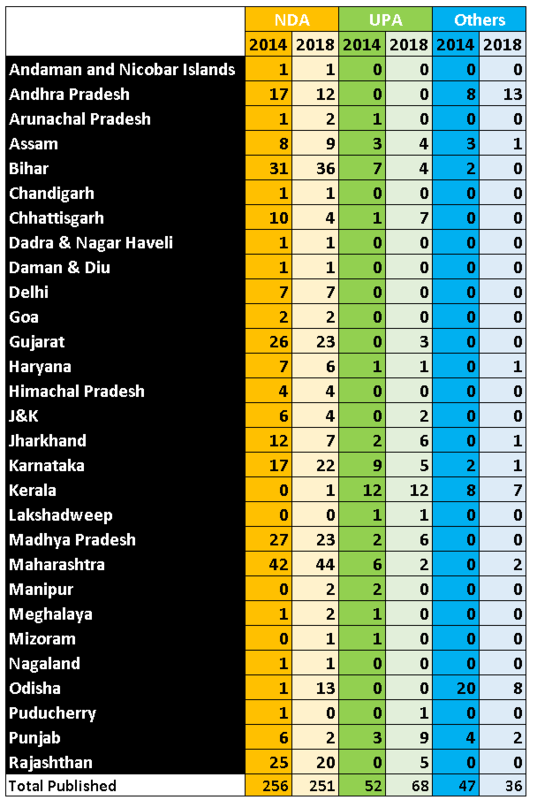 All in all, the NDA is projected to win 335 seats if the elections were to be held today, just 1 seat less than in 2014. The NDA is expected to make up for its losses in the HIndi Belt with the gains it is expected to make in Eastern States and in Karnataka. The C-Voter Poll also remarks that 66% of the voters prefer Narendra Modi as the Prime Minister of the country while only 28% of the voters want Rahul Gandhi to lead the nation. Therefore, if the NDA could again transform the battle for 2019 as a head to head war between Narendra Modi and Rahul Gandhi, its return to power is relatively assured.